The Brief: To create a greeting card incorporating cookies and sweet treats to wish someone a happy holiday. Done for Paper Heart Dispatch, an online stationary shop. Cookies are always top of mind at the holidays, so what better way to wish someone a happy holiday season than with a sweet rendition of some cookies in a cute illustrated way. 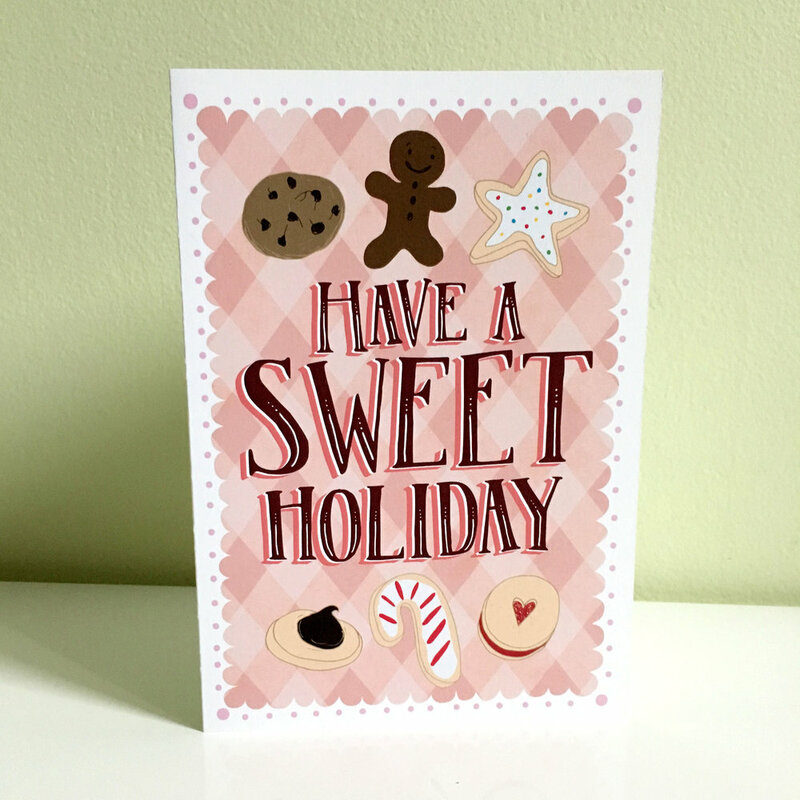 This card, “Have a Sweet Holiday”, contains many hand-illustrated cookies to fit the theme of the lettering, cute and playful with some relaxing warm colors to warm up the autumn and winter holiday season. I drew the cookies and lettering on paper using pen and pencil, then scanned them into the computer, vectorized and colorized them in Adobe Illustrator, and then combined them with a cute diamond background and hand-drawn detailing. The printed card is ready for sale through Paper Heart Dispatch’s Etsy shop. Original pencil sketches and inked elements. Concepts exploring different colors and configurations. Final card design, printed and ready for sale!